Addams' was concerned with the issues of labor and workers rights, as well as the movement for decent working conditions and worker safety. For my contribution I referenced the terminology of Blue/White/Pink collar as a language that has historically been used to describe and divide different types of workers. 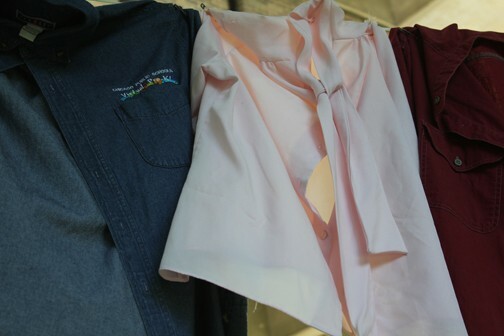 I collected 150 work shirts from people in all walks of life--lab coats, denim, shirts embroidered with corporate logos--and hung them between the Hull House and the Resident's Dining Hall, in such a way that their collective weight was sensed by anyone who passed underneath them.